It is almost painful to agree with The Guardian, but we do. It describes our adventure in Afghanistan as: "Mission impossible." It is. That was never pre-ordained. It could have been different, and it could still be different, but it will not be. As we have watched the train wreck that masquerades as strategy in this benighted country, we have become more and more convinced that it is wrong – totally, completely, fundamentally wrong. It cannot succeed. It will not succeed and the inevitable outcome is that, after the expenditure of much more of our treasure – which we can ill-afford – and the death of many more fine men (and, probably, some women), we will be forced into a humiliating retreat, dressed up as victory, leaving the country in no better a condition than when we found it – if not worse. This is not a knee-jerk reaction to the "grim milestone" of now 200-plus deaths in theatre. We have seen this coming and were prepared for it. But, while the media talks glibly about the first hundred deaths having taken from 2001 to early 2008 to have been reached, with the next hundred taking 15 months, what few if any have commented on is the fact that, of those 100, just over 50 occurred in the last five months ... an effective doubling of the casualty rate. Unless urgent action is taken on the ground by military commanders to minimise casualties, that is the continued fate of our soldiers – to fall to the combined threat of direct assault and, mainly, the unseen peril of IEDs, against which out military have no effective counter. That was the action taken in Iraq, with a retreat to our bases inspired entirely by the need to keep the headline death rate down. It was a self-defeating strategy, ceding control to the militias and abandoning the population which needed and deserved our protection. So it would be in Afghanistan, where a similar retreat would cede control to the Taleban and abandon any attempt to pacify and police the country. The alternative is to keep taking the casualties, and the current rate is politically unsustainable. The British forces – and to a great extent all the coalition forces – are therefore caught in a deadly trap. On the one hand, they are locked in to an unworkable and fatally flawed strategy. If they attempt to implement it, the result will be unacceptable casualties. On the other hand, if they prioritise on force protection, the strategy falls by the wayside and they achieve nothing, other than to see the violence escalate and the Taleban strengthen their hold. Either way, we lose – the Afghani people lose and the international community loses. 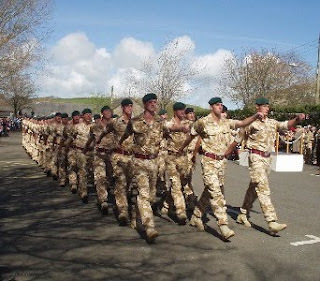 We might just as well lose from the comfort and safety of the UK, with the troops back home polishing their toys, rather than in Afghanistan, polishing the next batch of coffins. Consistently, on this and our sister blog, we have sought to offer advice on how to avoid this trap. This comes not from a reservoir of our own experience and knowledge of the area (we have, after all never been there). It comes instead from that ill-used and often misunderstood process of research and analysis. We don't know the answers, but we know lots of people who do. By listening, researching, studying, distilling and – above all – analysing the dynamics of this conflict, certain basic principles emerge which are of unchanging value. At the core of this is the central precept that "security" – the Holy Grail of our current endeavour – cannot be imposed on an unwilling or cowed population. It must emerge from them. Thus, the objective of a counter-insurgency campaign must be to create the conditions whereby the people themselves opt for security, and strive to achieve it, not as passive observers watching the manoeuvres of foreign troops, but as active participants. Therein lies the fatal flaw in our strategy. By artificially creating a divide between "security" and "development", and making the latter dependent on the former – then seeking to impose security as a precursor to any further endeavour – we are setting ourselves up for failure. Bizarrely, those involved with this train-wreck of a strategy cannot see the logical flaws of their own creation. All of them will happily chirp that there is "no military solution" to the insurgency. Yet, they say, the solution is to impose security. And what is that if not an attempt at a military solution? Thus, the only way out is to forge ahead with development, the military task thence being defined as to protect (and in many cases carry out) the development. The unreformed lefties of the FCO and DFID should be retired early and sent home, together with their fatuous "hearts and minds" cult. The only "development" worthy of the name is hard-edged infrastructure improvement – roads, rail where necessary, communications, electricity, airports – plus industrial and commercial development. The aim here should be to enhance wealth-creating activities, enabling Afghanistan to capitalise on its considerable economic assets. With economic stability comes social stability. As far as governance goes, there are only three requirements. Firstly, there must be imposed an equitable system of property rights, and a means by which citizens can enforce them. Without that, there can be no progress. Secondly, the government of Afghanistan must be given a deadline to establish a universal taxation system. It must be set targets for revenue collection and we should then reduce the amount of international aid paid directly by the amounts we have set the government to collect for itself. A government that lives off international aid has no need of its people and a people that does not pay tax to its government has no need of a government. If the people then want schools 'n' hospitals, let them lobby their own government to pay for them – and pay the taxes to support them. We should not be providing them. Thirdly, develop an agricultural policy, subsidising small famers to stay on the land and to produce food crops. Whether Pashtuns or Anglian barley barons, farmers are farmers throughout the world - a calling that transcends nation, ethnicity and religion. If they can make money out of growing crops and rearing animals, they will do so. Give them the money and the opium problem will solve itself. As to the international community generally, it should do a series of vital things. First, grant Afghanistan favoured nation status for the purpose of trade. Secondly, it should allow free access to Afghan produce, without tariffs or similar restraints. Thirdly, it should buy the goods. A Tesco supermarket buyer with a cheque book is worth a battalion of troops. Then, there is the vexed question of building up the Afghani security forces. Forget it. This is a matter of the Afghani government. A government that depends on its people – aka taxpayers - for survival will find a way of protecting its people – aka revenue base – from outside interference. The initiative must come from the government. Then we can help, but only then. None of this, though, is going to happen. The principles have been talked about endlessly. Those in the know agree with these fundamentals, but lack the wherewithal to make them happen. Policy is decided, therefore, not by reference to what is right and necessary – and that which works – but what is possible within an entirely inadequate and dysfunctional framework. And, for that, soldiers die. That is not good enough. We have had enough of futile gestures and the posturing of politicians. If we can't do the job properly – and we can't – then we should get out. Bring our troops home. Good news ... and bad?